COURSE DESCRIPTION: This interdisciplinary introduction to digital humanities and the use of historical research in literary analysis examines two often overlooked labor migrations that profoundly influenced the shape and timing of the emergence of modern Caribbean literary culture: The immigration of Chinese and Indian indentured laborers into the French, Dutch, and British West Indies between 1838 and 1917, and the emigration and return of the Afro-Caribbean workers who went to Panama to build the canal between 1904–1914. Both groups worked under difficult conditions for exploitative wages, yet both managed to accumulate savings that bankrolled their entry into the educated middle class. Moreover, the new cultural forms and political aspirations they introduced to the region profoundly shaped Caribbean literary production and anti-colonial political movements. In this course, students will learn how to use archival material related to these migrations, including historical photographs, oral histories, and newspapers to enrich their understanding of Caribbean literature about these migrations, including the work of Jamaica Kincaid, David Dabydeen, Claude McKay, H.G.de Lisser, Maryse Condé, V.S.Naipaul, Ramabai Espinet. The course introduces students to the digital humanities and digital archiving. It makes extensive use of the Digital Library of the Caribbean (www.dloc.com), an open-access digital archive, whose technical hub is at UF. Students will have an opportunity to add their annotations to the finding aids in the dLOC collection and produce a digital humanities project as a final project. 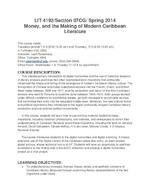 LIT 4192/Section 07CG/ Spring 2014 Money, and the Making of Modern Caribbean Literature This course meets Tuesdays periods T 2 3 (8:30 10:25 am) and Thursday, R 3 (9:35 10:25 am) in Turlington Hall, 2346 Instructor: Leah Rosenberg Office: Turlington 4346 Email: rosenber@ufl.edu ; phone: (352) 294 2848) Office Hours: Wednesday 1 3; Thusday 11 12 & by appointment COURSE DESCRIPTION: This interdisciplinary introduction to digital humanities and the use of hi storical research in literary analysis examines two often overlooked labor migrations that profoundly influenced the shape and timing of the emergence of modern Caribbean literary culture: The immigration of Chinese and Indian indentured laborers into the French, Dutch, and British West Indies between 1838 and 1917, and the emigration and return of the Afro Caribbean workers who went to Panama to build the canal between 1904 1914. Both groups worked under difficult conditions for exploitative wages, yet bot h managed to accumulate savings that bankrolled their entry into the educated middle class. Moreover, the new cultural forms and political aspirations they introduced to the region profoundly shaped Caribbean literary production and anti colonial political movements. In this course, students will learn how to use archival material related to these migrations, including historical photographs, oral histories, and newspapers to enrich their understanding of Caribbean literature about these migrations, including the work of Jamaica Kincaid, David Dabydeen, Claude McKay, H.G.de Lisser, Maryse Cond, V.S.Naipaul, Ramabai Espinet. The course introduces students to the digital humanities and digital archiving. It makes extensive use of the Digital Lib rary of the Caribbean (www.dloc.com), an open access digital archive, whose technical hub is at UF. Students will have an opportunity to add their annotations to the finding aids in the dLOC collection and produce a digital humanities project as a final pr oject. LEARNING OBJECTIVES: To understand key concepts, themes, tropes, styles, and aesthetic concerns of Caribbean literary discourse through examining literary representations of the two migrations under study. information or a document posted by another student, you must cite that work. (Research.) 5. Answer or comment on any contribution (theme, question, analysis) by another student or the instructor. (Minimum of 125 words.) (Analysis) One contribution for each of the these texts or groups of texts: 1. H.G. de Lisser, Susan Proudleigh (and texts assigned with it, e.g. Introduction to Coniff's book ) 2. Ramabai Espinet, The Swinging Bridge (and texts assigned with it, e.g. Anna Mahase's Memoir) 3. Maryse Conde, The Tree of Life (and texts assigned with it, e.g. Martin's Essay) 4. Short Stories on Indo Trinidadians (See week 6 and 7) 5. Chines e Caribbean experiences Grading Criteria for Wiki Contributions Analysis A contribution that merits an d emonstrates a nuanced understanding of the text(s) and performs incisive analysis of one passage, concept, context, or ref erence. Communication It is written in a very clear, concise, and logical manner. Writing for online resources must be succinct. Presentation It contains no errors in spelling, grammar, or punctuation or very few. It is presented on the correct page of the class PBworks site. It is clearly readable (using the same font as the rest of the page and obscure other contributions). It contains relevant bibliographic information in MLA format a nd supplies URL addresses where relevant. Research (For the web presence and historical/cultural context contributions) The successful contribution will identify a relevant and significant source(s) and provide a strong explanation or evaluation of them. If explicating a historical or cultural context or reference, the contribution will explain the significance of the context for the literary text and provide the specific passage(s) to which it pert ains with page numbers. Grading Rubric for Assignments 1 4 Successful assignments will: 1. Fulfill the specific requirements in regard to subject matter required in the specific assignment. 2. Identify a relevant and rich historical source(s). 3. Explicate the historical and cultural significance of that source, paying attention to form and context. (For Assignment 1, this source will be the hearing testimony of the person you choose from Misery.) 4. Articulate the insights in lucid and straightforward prose. 5. Provide bibliographical information in MLA format and 1qaz URL (if possible). 6. Use correct grammar, punctuation, and have few if any typos 7. Be posted to the homepage and linked to the appropriate Assignment Page in PBWorks in easily legible form. 8. Make use of relevant concepts and information from scholarship and/or literature we have read to elucidate the text under examination (when possible and/or effective). FINAL PROJECT: COLLABORATIV E GUIDES AND ANNOTATIONS (Initial proposal due 10 April, partial draft due 15 April, 2nd installment due 17 April; presentation of a complete draft of the project 23 April, final draft due 29 April. ) The Swinging Bridge or Tree of Life The overall goal of the project is to elucidate the literary text through analysis and historical and cultural contextualization and to provide useful themes, questions, and references for future instructors and students. Students will work in groups to produce a gu ide to the historical and cultural references and important aesthetic or formal aspects of these novels. Each group will be responsible for a chapter or series of chapters in one of the novels. Emphasis may be placed on using primary historical documen ts to contextualize the setting of the novel and illuminate the significance of the particular representation of historical events or identities. (The sections will be designated by the instructor in consultation with the groups.) Each group will p rovide key concepts, study questions, and explications of important historical and cultural references and literary aspects as well as an evaluation of relevant online resources for their section of the text. Groups are encouraged to include at least one p rimary or archival source. The project must include bibliographic information in MLA format for its sources. Each group will also write a brief statement that introduces the group members and indicates the groups collaborated. All groups will meet with the instructor to discuss the project. Contributions will be posted on the appropriate page of the PBWorks wiki, and, if students so desire, successful projects will be added to the dLOC. Grading Criteria for Final Projects 1. The project includes each of the criteria listed above (themes; questions; explication of references, contexts, and formal characteristics; evaluation of online resources; bibliographic information on works cited). 2. The project must be a collaborative effort in which each student contributes significantly and as equally as possible. It includes an introduction to the authors of the project and the nature of their collaboration. 3. The project identifies important themes and explains their significance. 4. The project articulates important questions in a straight forward fashion. 5. The project provides insightful explication of cultural and historical contexts or references and explains their significance to the text. 6. The project incorporates at least one archiv al document or other item. 7. The project provides a coherent evaluation of online resources and provides URLs for strong online resources. 8. The project is written in straightforward and succinct prose with as few typos or other errors as possible. 9. The project is presented in a well designed fashion with visual clarity. It is easy for readers to find information and to understand the organization of the project. ASSIGNMENTS 1 4: Assignments should be posted on your home page in PBworks wit h a link to the appropriate assignment page. No assignments will be accepted late unless students have requested and received an extension. Submit all requests for extensions at least 24 hours in advance of the deadline except for cases of emergency. A SSIGNMENT 1: READING THE COLONIAL ARCHIVE [Due 5 pm on 26 January] This assignment introduces you to how scholars negotiate the colonial archive in making meaning. Part 1 1. Focus on 1 witness' testimony from Verene Shepherd's Maharani's Misery. 2. How do you evaluate the significance of this testimony? 3. How do you use other testimonies to qualify (e.g., verify, contradict, etc.) this version? 4. What other conditions influence how we read these sources (e.g., additional historical contexts, the ackn owledged absence of information, etc.)? 5. Document your reasoning and analysis (500 words) and post to the Wiki page for this assignment Part 2 Using Hartman as your model, imagine your version of events (500 words) and post to the Wiki page for this assignment. ASSIGNMENT 2: REPRESENTING WEST INDIANS IN THE PANAMA CANAL ZONE [Due 10 February by 8 pm] This assignment examines how literary texts transform the historical record. Choose 1 scene from Susan Proudleigh or Tropic Death that represents a specific historical event (e.g., reasons for migrating to Panama, passage to Panama, encounters with Americans, living conditions, industrial accidents, etc.). Choose 2 related historical sources. 1. How are the West Indian characters represented ( e.g., body, race, color, class, gender, skills, profession, and an individual's reasons for migration, etc.)? a. In the novel? b. In the 2 historical sources? For each, examine what the author includes and excludes. 2. What do these selections and interpretive choices tell you (500 750 words)? Suggested sources listed in assignment page in PBworks & in Zotero ASSIGNMENT 3: WORKING WITH NEWSPAPERS [ Due 21 February by Midnight] This assignment allows you to think about how newspapers create historical meaning. You may focus on any aspect of Panama or Asian migration for this assignment. Browse the newspapers available online. A list will be posted on the Wiki page for this assignment. Choose one that contains stories about West Indians in Panama and/or Asians in the Caribbean. Select a news item related to the migrants. Examine the representation of immigrants or migrants. Read the entire issue of the newspaper in which the article appears. What kind of items does this newspaper carry (e.g. ads, editorials, letters, news, literary pieces, cartoons)? What can you tell about the newspaper's readership and political orientation? Write (500 750 words) for the Wiki characterizing the representation of im/migrants and the newspaper Post to the Wiki page for this assignment. ASSIGNMENT 4: VISUALIZING THE ARCHIVES & CREATING METADATA (Due March 16 at 5:00 pm) This assignment asks you to examine how photography historically has constructed the raced subject. ASSIGNMENT 4: VISUALIZING THE ARCHIVES & CREATING METADATA (Due March 16 at 5:00 pm) This assignment asks you to examine how photography historically has constructed the raced subject. Part 1: Choose 1 image from photographs you examine in Special collections, from the photo gallery. or from other online sources for Caribbean photographs such as Duperly, Picturesque Jamaica which has images o n Indo Caribbean people on pp. 66 and 68 o see also Duperly Coolies At Worship. http://www.caribbeanphotoarchive.com/ Nat ional Archives UK Caribbean through a Lens Project National Archives UK Caribbean through a Lens on Flickr The National Anthropological Archives (part of the Smithsonian Museums) Examine the photo and consider the following: Note the gender of the subjects; their position vis vis, machines, animals, vegetation, buildings or other raci al subjects. What do you know about the photographer or what position or perspective do you imagine he/she had? What is the historical context for the photograph? If so, does the historical context (or moment in history) have particular significance? Is it possible to find sources on that context? Is the photograph dated? Is there a caption? What do these selections and interpretive choices tell you? Write (500 750 words) on the provenance of the photograph and the way it constructs its su bject. Paste the photo from the photo gallery into your Wiki entry. Readings: Shepherd, Verene. Read Preface, Introduction, and Chpt. 1. Recommended: Dhanashree Thorat, DH Project: http://indianindenture.wordpress.com/ Week 3 Indentured Women in the Archive, 21 Jan. Readings: Shepherd, Verene. Misery Read Chapters 2, 3 and appendices 1 12. Hartman, Saidiya. Dead in Lose Your Mother pp. 136 154. E Reserves Rajkumari Singh, Aije: A Tribute to the First Immigrant pp. 189 190. Extra Credit for going to Lecture "Recovering Afro Hispanic Lives from Spanish Colonial Records....and Making Them Available 2:30 pm Wednesday, 22 January 2014, Smathers Library Room 1A Jane Landers, the Gertrude Conaway Vanderbilt Professor of History, Vanderbilt University will present from her current project, a biogr aphy of Francisco Menendez and on the digital humanities project she directs, and Secular Sources for Slave (ESSSS) at http://www.vanderbilt.edu/esss Professor Landers will address the rich documentary records available for persons of African descent in Spanish colonial archives, including those in Florida, and describes how unearthing one African man's fascinating life led to archaeological projects, publications, museum exhibits a nd, finally, a digital archive of similar records collected in Florida, Cuba, Brazil and Colombia. 13 Feb. Readings Read Wahab, Amar. West Indian Orientalism: Race, Gender and Representations of Indentured Coolies in the Nineteenth Century British West Journal of Asian American Studies 10:3 (October 2007): 283 311 Week 7 18 Feb. Assignment: Mendes, Alfred in From Trinidad p. 142 E Reserves De Souza, in The Beacon I/8 (November 1931), pp 18 19 E Reserves Naipaul, V.S. Chosen in Miguel Street pp. 24 31 E Reserves Identify a newspaper or Journal to work on for assignment# 3 Read through the PowerPoint on the home page introduces this class and consider how Indians in the Caribbean and West Indians in Panama are represented. 20 Fe b. No class. 21 Feb. Assignment #3 Working With Newspapers Due by Midnight Comment on one colleague's Assignment #3 on their home page by Sunday at noon Week 8 THE CHINESE CARIBBEAN EXPERIENCE 24 Februa Victor Chang Reading 4:00 pm in the New Judaica Suite, in the Special Collection Department on the second floor of Library East.